Managing, controlling and improving quality is a critical activity in modern business organizations. Quality is directly linked to productivity, competitiveness, customer satisfaction, business growth, elimination of waste and other non-value added activities, and overall business success. Cycle time and throughput is just as important in a hospital emergency room as it is in a semiconductor factory. Defects and errors don't occur just in factories, they occur in transactional and service business such as banks, insurance companies, and hospitals. Even your local and state governments have a keen interest in improving service quality in operations such as issuing drivers licenses and motor vehicle registration. The U.S. Navy has had an intensive quality improvement program for many years. 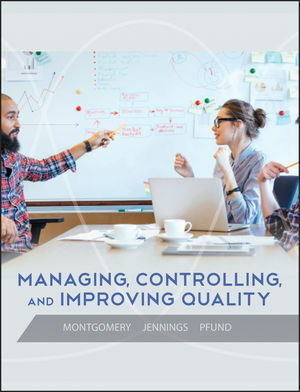 This book presents an organized approach to quality management, control, and improvement. Quality problems usually are the outcome of uncontrolled or excessive variability in product or service characteristics that are critical to the customer and statistical tools and other analytical methods play an important role in solving these problems. However, these techniques need to be implemented within a management structure that will ensure success. We focus on both the management structure and the statistical and analytical tools. Our approach to organizing and presenting this material is based on many years of teaching, research, and professional practice across a wide range of business and industrial settings.